One of the most fascinating pilgrim stories that I have come across in the course of my research is the tale the Irish priest Father Joseph Braughall. The following account is based on an article written by Gerard MacRory published in the Irish Monthly Journal of 1950. The article in turn appears to be based in the personal correspondence of the priest and Vatican archives. In 1821, Fr Braughall then aged 41, was the parish priest of Graignamanagh, Co Carlow (not to be confused with Graignamanagh Co Kilkenny). He became very ill and to use the old term ‘took the bed’. Fearing for his life, like many medieval pilgrims before him, the priest vowed he would make a pilgrimage to the Holy Land if he recovered. Braughall made a recovery although he was to be plagued throughout his life with recurring ill-health. Shortly afterwards he began preparations for his pilgrimage. The Bishop of Carlow Dr Doyle granted the priest a leave of absence and he sold his belongings. In the summer of 1822 he set sail to France with £5 in his pocket . Given the geographical location of Carlow its likely he set sail from Dublin or the port towns of New Ross or Waterford. He arrived safely in France and travelled on to Paris where he became ill again. Fearing that his ill-health would prevent his pilgrimage to the Holy Land he wrote to the Bishop Doyle informing him that he planned to travel to Italy to join the Carthusian order instead. The Cartusian’s were founded by St Bruno in the late 11th century and their life style combined eremitical and cenobitic life. When he was well enough he travelled to Rome. His health must have improved as he changed his mind about becoming a hermit and decided to continue with his planned pilgrimage. Braughall proceeded to the Vatican where he received an audience with Pope Pius VII. 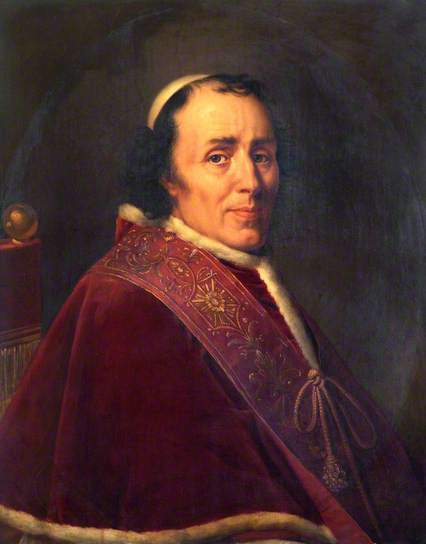 Pope Pius VII blessed Braughall’s pilgrim habit and presented him with documents of authentication necessary for his journey to Jerusalem, Syria and Palestine. Father Braughall left Rome and with great difficulty managed to secure passage on a ship sailing to Cyprus in the Italian port of Livorna, (known in English as Leghorn). He continued this journey from Cyprus to Beirut in Lebanon on board a felucca, a wooden sailing boat with a distinctive sail used in the Mediterranean, the Red Sea and the Nile. 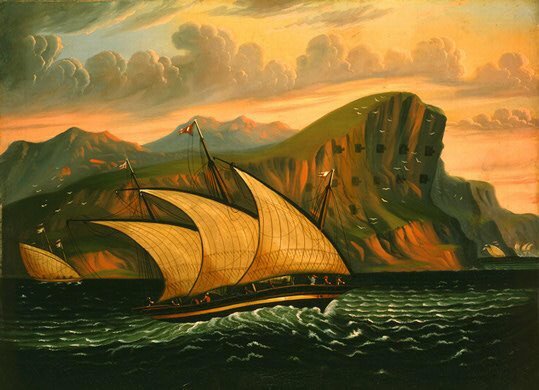 Painting by Thomas Chambers (English-born American artist, 1808-1869) Felucca off Gibraltar. 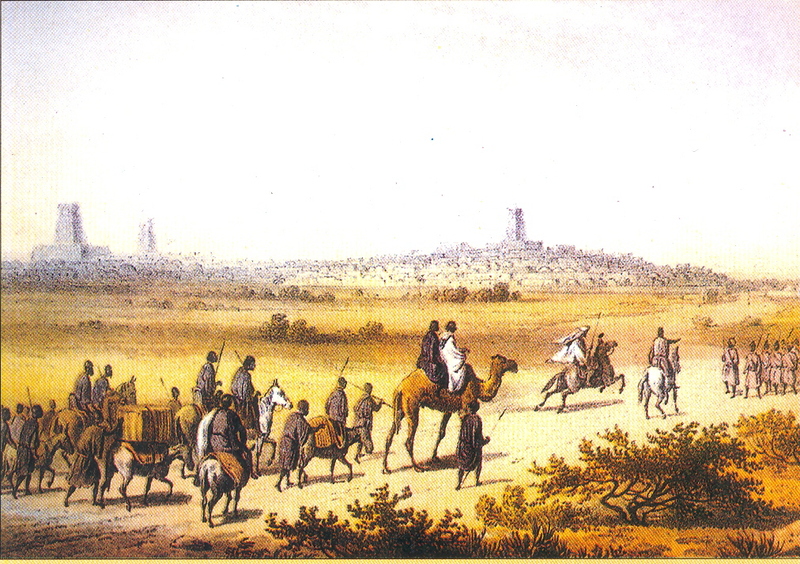 From Lebanon Braughall managed to secure passage with a trade caravan travelling to Jerusalem. When he finally arrived in Jerusalem he was physically in a weakened state and his finances were exhausted. 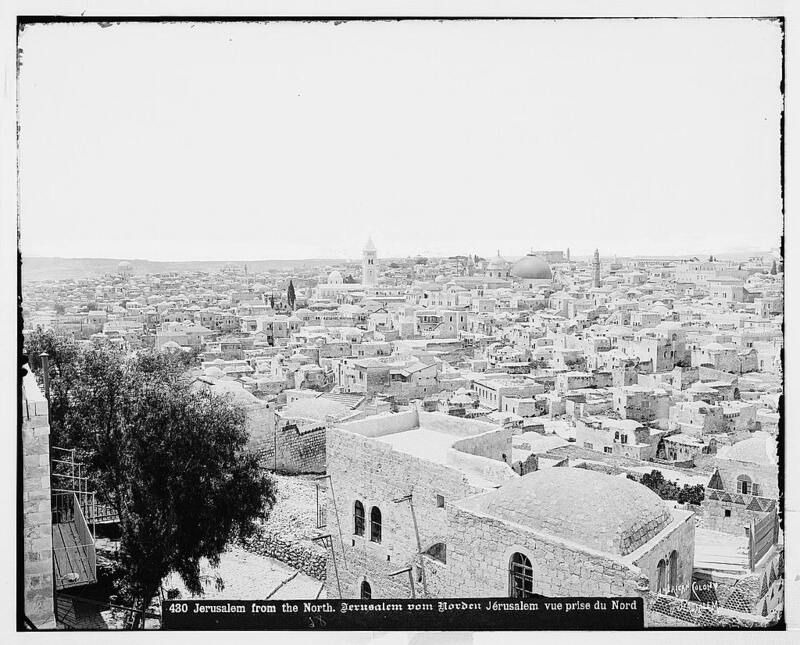 At this time the Holy Land was part of the Ottoman Empire. Any pilgrim wishing to enter any of the pilgrim sites such as the Holy Sepulchre could only do so at certain times and upon payment of a fee to the Governor of the city. Fr Braughall requested and was granted an audience with the Governor of the Provence. The priest must have made a good impression on the Governor as he was granted a free pass to all the shrines in Jerusalem. Having completed his pilgrimage which included praying for 9 days and nights within the Sepulchre church, while existing on bread and water, he set off on his return journey. We are told he travelled to Cairo in Egypt but became ill with fever and dysentery. While in Cairo he stayed with a small religious community. The community appear to be Franciscan missionaries and consisted of four priests and two lay brothers. Within days of Braughall’s arriving the community had succumb to his illness and died and he was forced to bury them. Braughall may have felt some responsibility for their deaths as he stayed on in Cairo and took over their duties until he was relived. MacRory states up to 40000 people died in the city during this outbrake. Once his replacements arrived with the help of the English Consul he received passage from Alexandria back to the port town of Livono in Italy. We are not told what he did next but his health deteriorated yet again and for the next few years he seems to have drift through Portugal and Spain. In 1838 he returned to Carlow penniless where he remained for a short time as a guest at St Patrick’s College in Carlow town. He had been away for 16 years. The President of the college Dr Fitzgerald invited him to stay permanently but he refused deciding instead to return to Italy to live out his days as a hermit. In 1839 Braughall set out again for Italy and travelled to Vesuvius where he tried to enter one of the many hermitages dotted along the mountain slopes. The church authorities of Naples in whose jurisdiction the hermitages were became aware of his presence and were suspicious of his motives. They demanded to see his papers of identification which he could not produce. He was then forced to write to the Sisters of the Presentation Convent at Carlow appealing to them to approach the bishop and to ask for a letter stating who he was and of his former pilgrimage to the Holy Land. It is interesting that he did not write directly to the bishop. Eventually a letter arrived from the bishop and was presented to the authorities but they still remained suspicious and demanded the letter be authenticated by the Holy See. Once the Vatican confirming his story Fr Braughall left Naples and joined the Benedictine monastery at Mount Cassino. 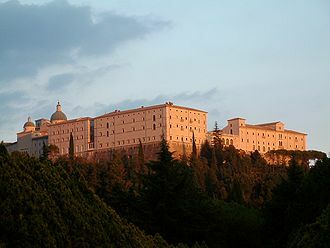 It is recorded that when the King of Naples and his family visited Mount Cassino they found Father Braughall kneeling in adoration before the Tabernacle. The royal party, preceded by the King, reverently took up and kissed the hem of Father Braughall’s habit, while he, unconscious of their presence in the depth of his devotions, prayed on. Fr Braughall made one final pilgrimage to the Holy Land following the vision of what he believed was his Angle Guardian. He died in 1850 and was buried at Mount Cassino along way from Carlow. This entry was posted in Uncategorized and tagged 19th pilgrim from Ireland, Fr Joseph Braughall's pilgrimage to the Holy Land, Holy Land, Pilgrimage Carlow.